These DVD cases are great for protecting your DVD media because they're durable and built to last through extended use. These are standard sized DVD cases — The same DVD cases used by major studios to protect DVDs. With a clear acetate coverslip for a custom cover, these black cases also feature locking hubs to hold discs securely by their center holes. Inside front cover has the literature clips for including a pamphlet, instructions, or track list. Fits all standard compact disc media, including games. DVD cases hold 1 disc (not included). Professional, machine loadable DVD cases made from partially recycled materials. 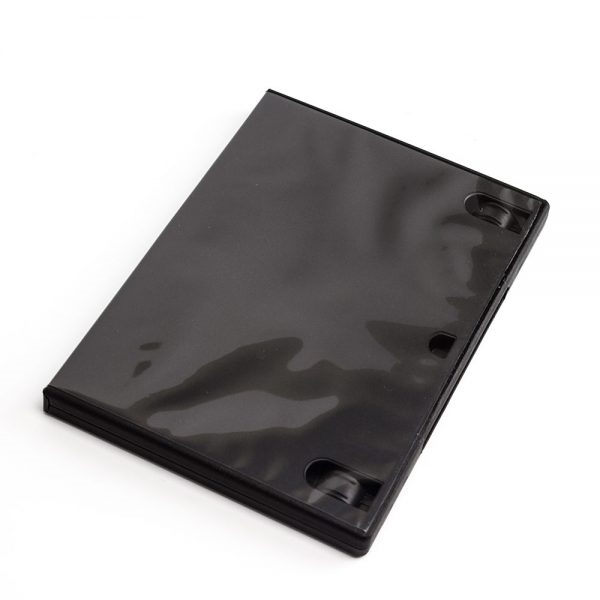 These DVD cases are great for protecting your DVD media because they’re durable and built to last through extended use. These are standard sized DVD cases — The same DVD cases used by major studios to protect DVDs. With a clear acetate coverslip for a custom cover, these black cases also feature locking hubs to hold discs securely by their center holes. Inside front cover has the literature clips for including a pamphlet, instructions, or track list. Fits all standard compact disc media, including games. DVD cases hold 1 disc (not included).